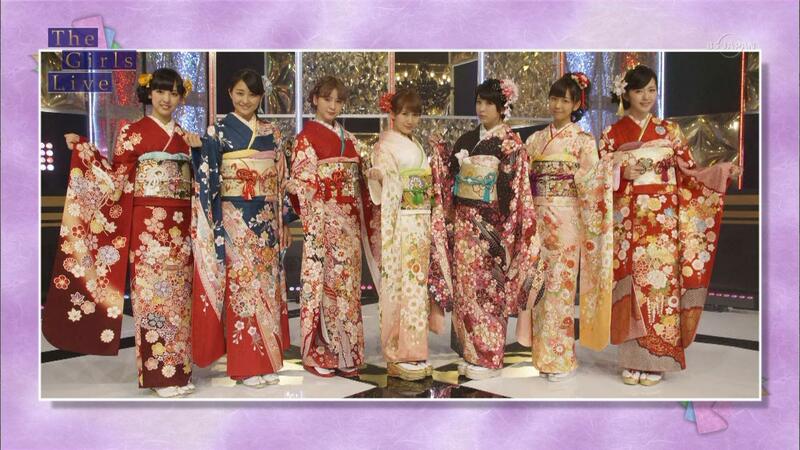 Aired on the 11th of January 2015, this first broadcast of the year has ℃-ute's Suzuki Airi dressing up her fellow H!P members in furisode, formal long-sleeved kimonos. One ceremony where furisodes are usually worn are coming-of-age ceremonies, and Airi will be dressing up the 7 H!P girls who will be celebrating their coming-of-age this year: Juice=Juice's Miyazaki Yuka, Morning Musume。´15's Iikubo Haruna, ANGERME's Wada Ayaka and Fukuda Kanon, ℃-ute's Okai Chisato and Suzuki Airi, and Berryz Kobo's Sugaya Risako. 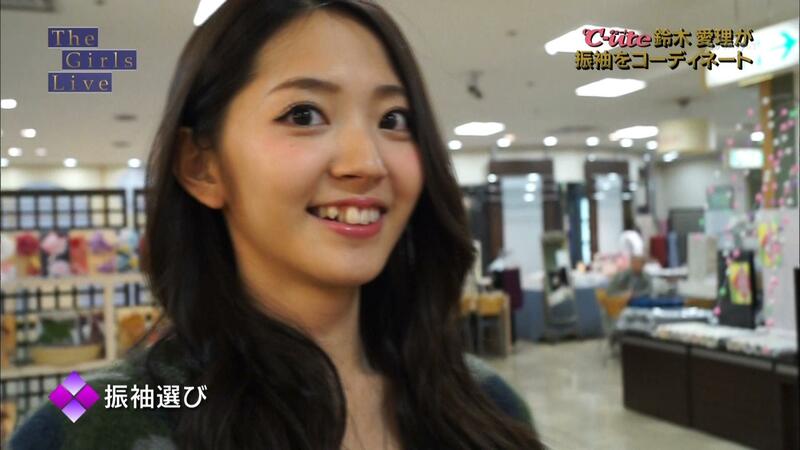 She can't even bring herself to say the amount at first, but eventually reveals that it was 1,280,000 yen. As the main display, it was hand-crafted with gold embroidery and gold leaf, but the store assistant shows her some more reasonably priced ones. The differences in price come down to how they're made - mass-produced machine ones are obviously cheaper, while the handmade ones come at a premium. One way to tell is to look at the reverse side - the print of the machine-made ones doesn't seep through, while with handmade ones, the design seeps through to the reverse side that you might not be able to differentiate the interior with the exterior. She's still lost when in comes to picking furisode, so the shopkeeper informs her that generally people start with the colour, then the design - classical or modern. Airi starts by looking for one for herself, to give her an idea, and remarks that navy blue is in fashion this year before heading to the shopkeeper for recommendations. The shop assistant recommends something bold as Airi's fairly tall. Airi also has to pick out an obi (sash) - adding even more to the cost of the furisode. She then gives one a whirl. 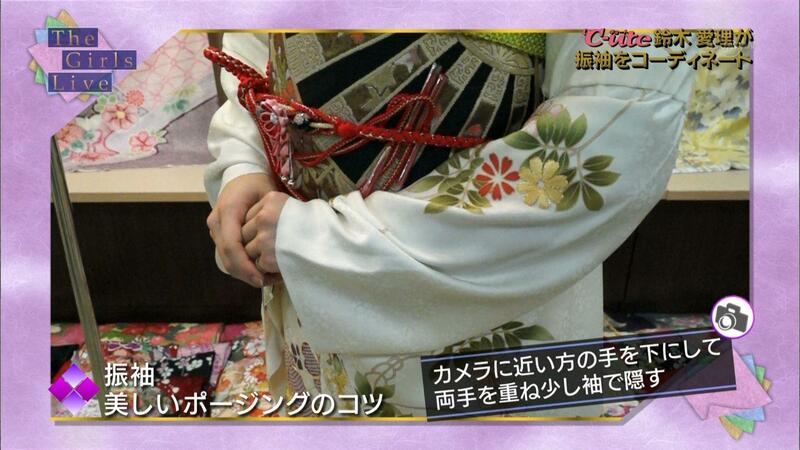 Now, the programme introduces tricks in order to get the best furisode commemoration photo. That done, she looks for furisode for the other members, completing the set. 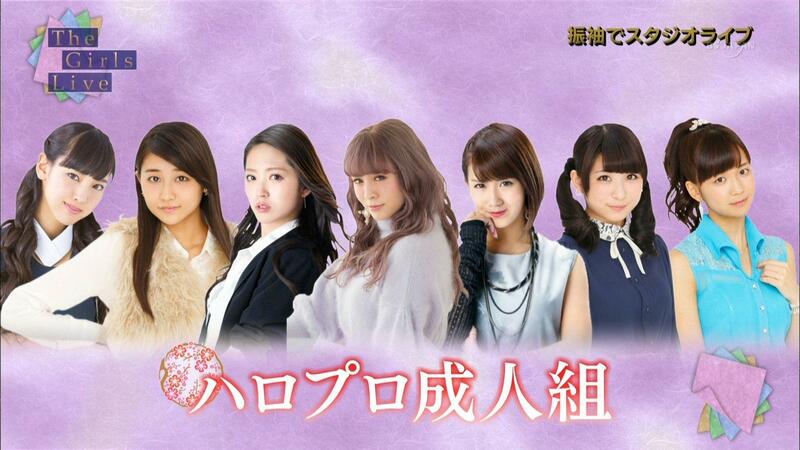 Furisode-clad, the girls perform a song titled '1月1日’ - the first of January. The girls are generally happy to get to wear furisode, even if Chisato and Risako stumble over the specific terms. Risako found it refreshing as the 7 of them aren't really a combination that normally gets together. Harunan's happy that her hair ornament is in her member colour. Airi explains that it's because her dress doesn't really have her member colour in it, so that's where she decided to highlight it. The programme goes on to cover the Winter Hello! Cons performances, with a short clip of all of H!P performing 'Futsuu, Idol 10nen Yatterannai Desho!?' The coverage starts with Morning Musume。´15 performing 'Tiki Bun', before we get a short message of the girls wishing us a happy new year. Oda-chan's got juniors for the first time, and she'd like to improve her skill at interacting. Next we have the newly renamed ANGERME, with a clip of them performing 'Taiki Bansei'. For their message, Rinapuu would like a hall tour, and hopes that their Budokan performance will be a success. Ayacho notes that their 6-man Budokan was a great success, and hopes that their first 9-person Budokan will be a huge success as well. Nyon's aspirations for the year include making more appearances on The Girls Live, and she'd like to make a regular corner. After a clip of Juice=Juice performing Senobi, we have Yuka personally wanting to improve at things like table manners, to be more aware that she's a grown-up. 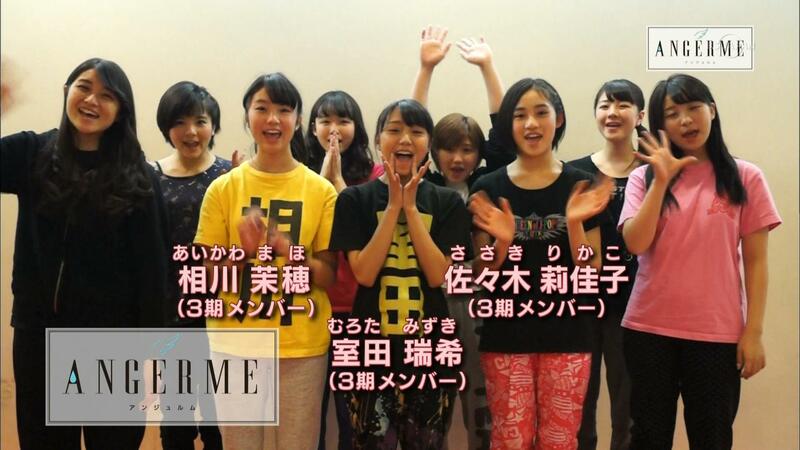 As Juice=Juice, their goal is definitely to tour around the 47 prefectures. ℃-ute entertain us with a clip of 'I Miss You'. They'll be celebrating their 10th anniversary this year, it's really got them thinking deeply - they were so tiny when they started out. ℃-ute would like to continue improving on the quality of their live performances, and hopefully do more overseas performances. 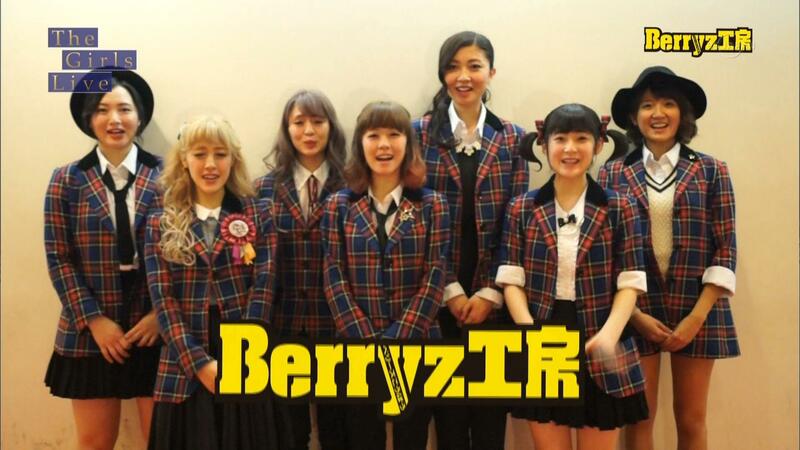 Berryz Kobo's part starts with a clip of them performing 'Love Together'. Chinami really wants to be able to speak English - her rival is Morning Musume。´s Nonaka-san. She may be a junior, but Chii refers to her with a 'san' - that's how much Chii respects her. Chii then messes up her words, prompting Momochi to tell her that it's probably impossible, given that she's still failing at Japanese.